Free Rein Guest Ranch, British Columbia, Canada. 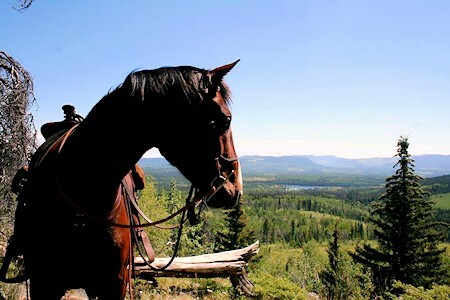 Horseback Riding & Western Vacations in BC's Cariboo Country near Bridge Lake. Lake on the world famous Fishing Highway in the historic south Cariboo region of British Columbia. Conveniently located en route between Vancouver and the Rocky Mountain parks of Jasper and Lake Louise, we are perfectly positioned for those visitors wishing to incorporate a ranch stay into their Canadian adventure itinerary. Our family owned guest ranch is situated on 285 acres in some of Canada's most beautiful wilderness with rolling hills and hidden lakes, secret meadows and secluded trails to explore under vast Western skies, Free Rein Guest Ranch is the perfect backdrop for your ranch retreat and guest ranch vacation. At Free Rein Guest Ranch you'll enjoy a spectacular view of the surrounding Cariboo countryside from your very own deck and experience the closeness of nature. 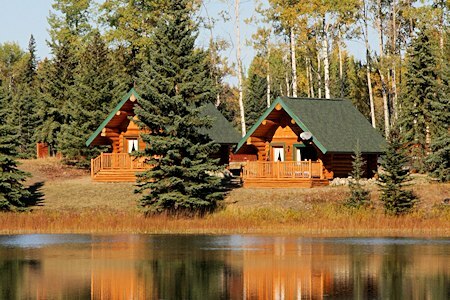 Nestled amongst the evergreens and overlooking our lake, our charming cabins are comfortably furnished. Each cabin has a private bathroom with shower, queen size bed in the loft and bunk beds downstairs, a kitchen includes a microwave oven, hot plate, and fridge. Our cabins are centrally heated and can comfortably accommodate 2-4 people. At the very heart of our ranch is our beautiful lodge, with views of the lake, corrals and our horses, you will surely not miss a single aspect of ranch life while staying in one of our luxury suites. Each of our three lodge suites has a private deck and a private bathroom with a shower and toilet. Tea and coffee making facilities are available in all of our accommodations and fresh Egyptian cotton linen and towels will be provided for your convenience. Whether you are a complete novice or accomplished rider, we have the horses and the rides to inspire you. Horse handling, riding lessons and horsemanship clinics are all included in your stay with us. Explore remote and stunning landscapes … ride up high to encounter dramatic vistas and panoramas of the ranch … search for cattle on the range … or simply hang back at the ranch and improve your skills in the arena with instruction if you prefer. At Free Rein Guest Ranch, near 100 Mile House in the South Cariboo, you can follow winding paths through dense pine forest, bathe in dappled sunlight streaming through the leaves of trembling aspen, gallop across open range and water your horse at the creek by the old homestead. Search for the ancient Native Indian village, spot the eagle nesting sites and watch for signs of wildlife passing you by, wade through seas of wild flower meadows and feel the sweet smelling breeze in your face. There are thousands of acres of rangeland for you to explore, so pack up your saddle bags and get ready to head out for days crammed with adventure. We guarantee that there will be no nose to tail action in long boring line ups when you ride out with us. At Free Rein Guest Ranch you can be completely involved in the daily running of the ranch, or simply kick back and relax … the choice is yours. You can ride out and end your day by camping beneath star studded awe-inspiring skies on our weekly overnight camp out. Our fully provisioned camp is bound to be one of the highlights of your stay. We treat you to Al Fresco dining around the campfire ending your day in the saddle with a lazy saunter over to our teepee village at sundown. We also offer a BBQ evening and campfire frolics so prepare to settle around the campfire for this twilight feast. Exchange tales from the range and toast marshmallows on an open fire while the sun retires in the Western sky. Sunset reflections at dusk ripple across the water creating a genuinely magical ambience for this evening of entertainment. Mountain biking and hiking are also available around the ranch, so explore the surrounding trails on foot, or by mountain bike to experience a more exhilarating taste of freedom. 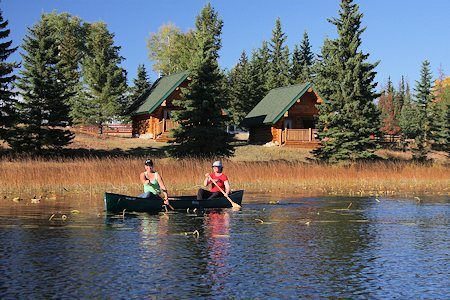 At Free Rein Guest Ranch you can also take an energetic spin on our lake by kayak, or paddle leisurely along in a canoe exploring the banks and identifying visitor footprints. Take a dip in the lake, relax in the sauna or simply sit on your deck watching Cariboo life. 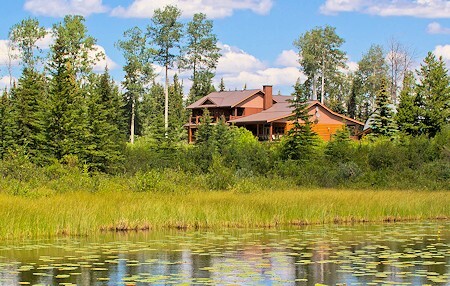 Our property provides a prime location for spotting a variety of wildlife, as we share our lake with an array of bird life, as well as moose, coyotes, deer, wolves and beaver. Come touch base with nature at the Free Rein Guest Ranch, and prepare to be inspired by the spectacular experience British Columbia has to offer. 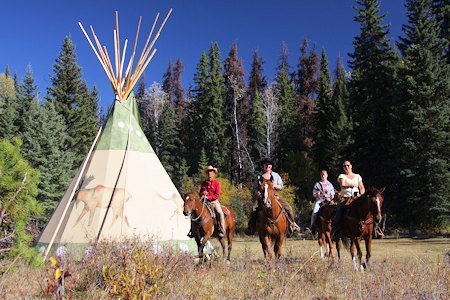 At the Free Rein Guest Ranch, located at Bridge Lake in BC's South Cariboo region, near 100 Mile House, a truly incredible vacation experience awaits.